Patients are encouraged to contact our office during working hours for all emergencies. Emergencies seen during office hours are given the next available appointment. We ask that patients with scheduled appointments call ahead of time if they have a loose bracket so that we can set-up the adjustment appointment properly. Loose bracket - Call the office to schedule an appointment to repair the bracket. If the bracket is attached to the wire, leave it in place and cover it with wax as needed for comfort. If the bracket comes out completely, bring it with you to your next appointment. Avoid connecting elastics or a headgear appliance to any loose brackets. Tooth soreness - Soreness will occur off and on during orthodontic treatment. Tylenol will help. Also, try to stick to softer foods during this time. Traumatic accidents - Use ice immediately to reduce swelling. 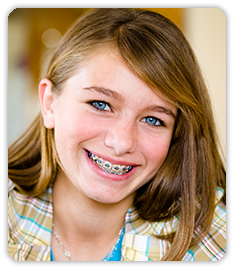 If the teeth are displaced and don't fit together properly, arch wires are bent, or soft tissue is stuck in the braces, call out office to schedule an appointment immediately.